Experience Revolutionary Boston and learn about the nation's history at the iconic Old State House museum. Included with your admission are historic rooms and exhibitions telling the story of Massachusetts from a colony to a commonwealth. 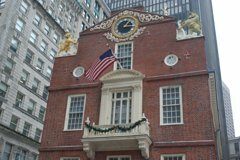 Join us on our daily guided talks to learn the history of the Old State House, the or the tragic tale of the Boston Massacre. Come to the Old State House, and once you're checked in you'll have the opportunity to explore our museum galleries at your own pace. On the first floor, you can learn about Boston's role in the events leading up to the American Revolution. You'll get a sense of the significance of the building you're standing in while enjoying highlights of our collection such as a vial of tea from the Boston Tea Party, and John Hancock's fashionable red coat. Then go up our spiral staircase to the second floor. Here you'll find a multi-media presentation on the Boston Massacre, Hands-on-History rooms that make history come alive, and the historic Council Chamber where the Royal Governor of Massachusetts once worked. Sit in the Governor's chair and see what it was like to be the most powerful person in the Massachusetts colony. During your visit, join one of our acclaimed guided tours to learn more about the Old State House and the events that happened here. Every 30 minutes from 10am-4pm, our Education Associates seek to tell you more about the history surrounding you. When you're done, peruse our extensive gift shop and purchase a souvenir so you'll always remember your visit to the Old State House.